If you read my pregnancy diary you may already know that I've suffered pretty bad with anaemia and have been taking Spatone liquid iron supplements to try an raise my iron levels. Ever since I had Gracie almost four years ago, I've suffered on/off with anaemia and I've always used Spatone original sachets mixed in orange juice as vitamin C helps to absorb iron. Whenever I started to feel tired and drained, mainly in pregnancy, I would start on the Spatone again. What I liked was the lack of nasty side effects compared to the iron tablets which commonly cause stomach cramps and constipation. Well at Britmums Live, I managed to speak to the lovely ladies from Spatone and got to try the new Spatone apple sachets, Spatone apple is your usual Spatone dose but already mixed with apple juice in a handy sachet. This means it tastes much nicer and is much more convenient for on the go. I was sent a months supply (a box containing 28 sachets) of Spatone apple to try so I could give them my thoughts and to see how it left me feeling by the end of the month. I've definitely found myself remembering to take my iron more frequently as I've left it in sight in the kitchen so if I'm in the house I take it there and then and if I'm in a rush going out I throw one in my handbag to take while I'm out. The first two weeks I didn't feel much different with my tiredness and energy levels. After the first two weeks though I started to feel less tired and lethargic and I can only assume it was the extra boost of Iron. I have also been informed by my midwife it is fine for me to take a double dose of Iron as my levels are so low and I need to keep them up for my C-Section so some days I have been taking an extra sachet, especially on days when I start to feel tired and drained again. It is not particularly cheap to buy, although I find most vitamins expensive. I have found it is on long term offer at both Boots, where it is £10.75 and Tesco where it is £9.95 with them both offering 3 for 2 across their vitamins range so you can buy a three month supply for the price of two months or you can mix your order with any other vitamins you may need to buy. Plus you collect points at both stores too if you have loyalty cards. 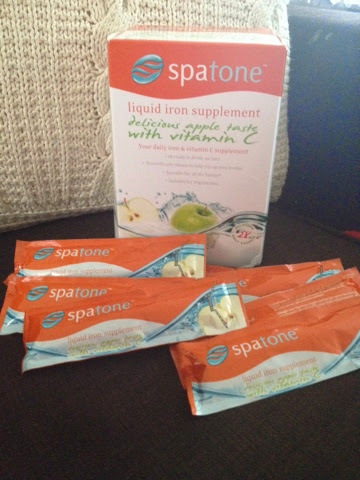 If you have low iron or are looking for a top up of your Iron I would definitely recommend trying Spatone. For me it's a pregnancy must-have! I was sent a months supply of Spatone to try free of charge but all opinions are my own. i had a try at the BM Spatone stand of one of those and really like it! i think i will go and get myself some to see if it makes any difference. great review! cant wait to see if it works for me i could certainly do with a bit more energy!